Kate in the Kitchen — Merry Christmas to all…. Every year, with the boxes all around me and the tissue paper pushed back, I gaze at my life in ornaments and baubles and am in awe yet again at the wealth of memory and nostalgia that we place on the accepting branches of our chosen tree. That gorgeous crocheted Santa, aptly named Lunar Santa, was made by my sister. It’s one of my most favorite ornaments. And I still have a handful or ornaments that my Grandma made for us. Every year when she came for Christmas, she would bring a box of her handmade treasures. They had tags on them, with our names in her perfect script. Several of mine still hold those tags, that memory of her permanently in ink. 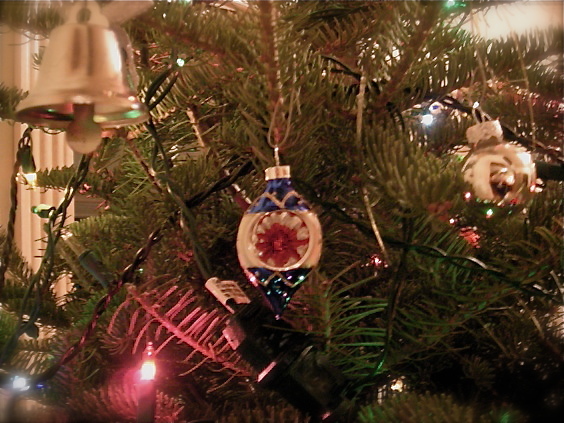 Some of the items on our tree were made by Griffin’s paternal Great-Grandmother too. I love this faded and fragile paper Christmas tree, with Griffin’s tiny little face in the center. He made it in Kindergarten and I hope I never forget the look on his face when he brought it home to me. He swelled with pride when we placed it on our tree that year. Next to it, see that even more faded little paper chain? 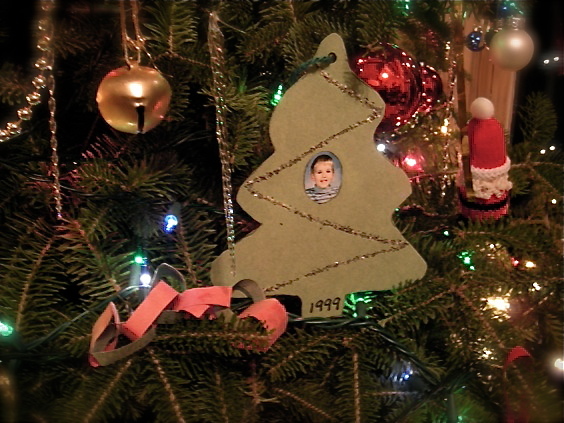 I made that in Kindergarten, thirty years earlier that the date on Griffin’s tree. The year that Christmas almost wasn’t was when Griffin was three. It was a pretty hard time of my life and the ocean of sorrow that swirled around me left me almost broke and lacking much holiday spirit. 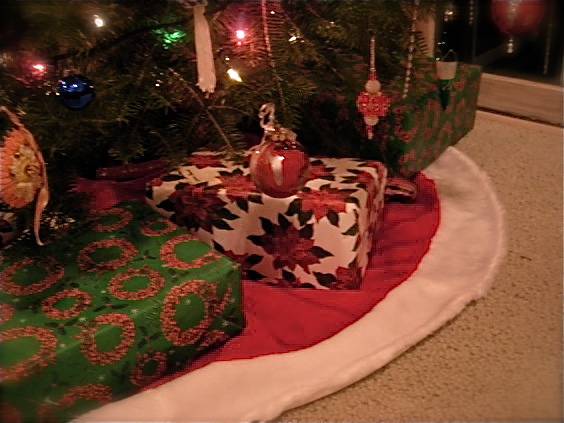 A friend of mine refused to let me wallow, and said “You need to celebrate for your son’s sake.” They took me shopping and bought me a few ornaments, a tiny little tree and stand and a few groceries. Among the ornaments was a box of these old-fashioned styled glass baubles in all sorts of shapes and colors. 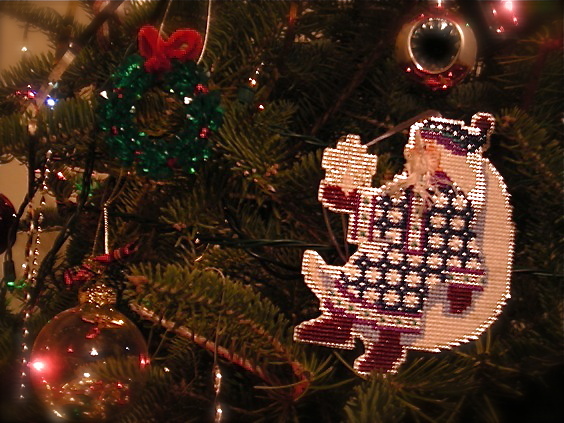 My family had some ornaments like this when I was very little and they reminded me of a better time of life, a time when we just had no clue as to the difficulties that lay ahead. Now, when I pull out the tin that lovingly holds this collection, not only do I remember some beloved childhood treasures, but I also recall the support and guidance of someone who gave selflessly to me at a critical time of need. It really isn’t fully festive during our decorating time unless someone grabs the Santa-inspired tree skirt and dances around the house with it around their waist. Usually it’s me. This year it was Griffin and I almost collapsed from the hilarity. But shhhhh….don’t tell him I mentioned that here. He is 15, you know. And me? I’m way beyond the need to shake the packages under the tree in a vague attempt to identify their contents, but that doesn’t mean that I don’t feel the urge every year when they start to accumulate. I hope that your Christmas is full of treasured people, whether it’s family, or the friends that feel like family. I hope there is delicious food, warm genuine smiles. I hope it is peaceful, because I sure know about celebrating Christmas when it’s the last thing you want to do. I hope snow is involved, if the climate allows, and twinkling lights fill your eyes. We’ll be staring at magical Christmas snow in amazing abundance this year. It is a VERY white Christmas. Hi Kate, I got the link to your blog on the Season’s Eatings Recap. You and I, apparently, are the two whose gifts fell into the “black hole”. Too bad – I was looking forward to blogging about it. You have a really lovely blog – I have bookmarked it and will be back to visit again. Oh! And I was born in St. Paul many years ago. I was just a little girl when we moved to California, so I don’t remember much except the COLD winters! Beautiful! 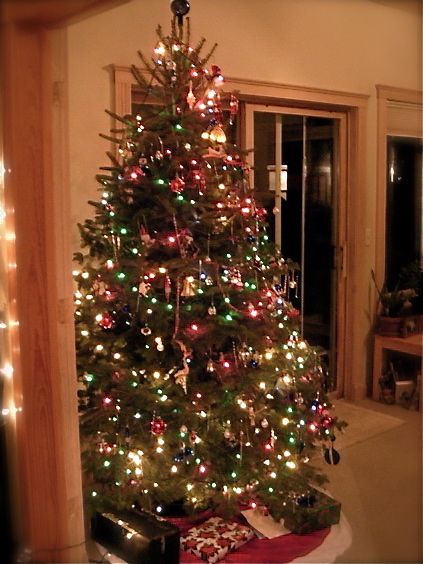 I didn’t get to put my tree up this year – or last, and I miss it. So many memories. I enjoyed yours instead… Especially the image of the tree skirt dance – I may have to try that….. I hope you had a wonderful Christmas! I have a few ornaments I feel nostalgic about, and learned the hard way next time not to buy them in glass. It was a rough year for the ornaments with all the little hands around. Merry Christmas to you too !! Your blog is lovely and so are your recipes. HA! That’s great! I love that Griffin has enough of his non-cool-teenage-boy self that he can still be silly (at least around y’all). Hope you have a very Merry Christmas!